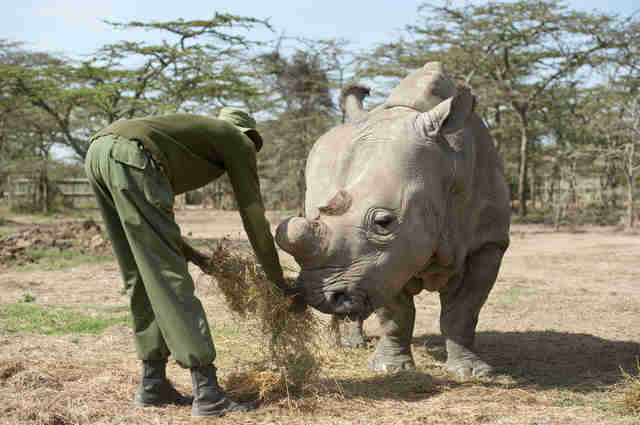 Sudan, a 45-year-old northern white rhino who represented the last hope for the survival of his subspecies, has just died at a conservancy in Kenya. He was surrounded by people who have been taking care of him for nearly a decade. Named for the country where he was born in the wild, when he was young Sudan was sent to the Dvůr Králové Zoo in the Czech Republic, where he lived for most of his life. 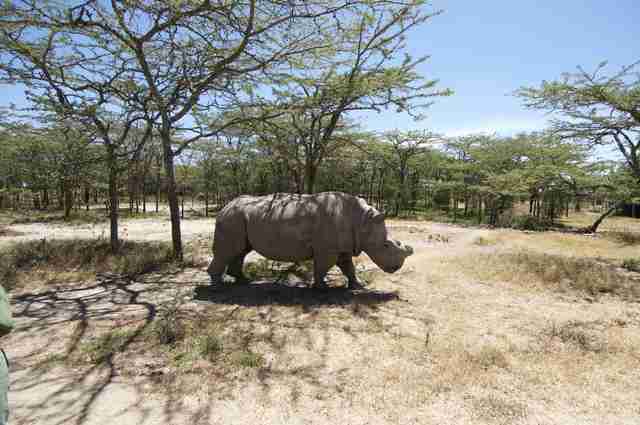 In 2009, Sudan was transferred to Ol Pejeta Conservancy in Kenya, where he lived with two younger female rhinos, Fatu and Najin, in hopes that living in a more natural environment would encourage the animals to reproduce, saving the subspecies from extinction. 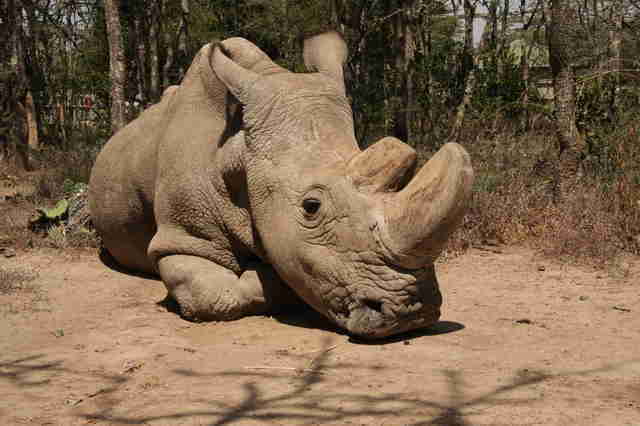 The last male of his kind, Sudan had 24-hour protection from armed guards determined to keep him safe from poachers. 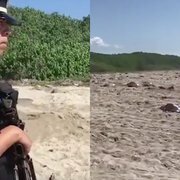 His horn was also removed to deter poachers from harming him. But the aging Sudan and his potential mates did not succeed in procreating. Understanding that this was a race against time, people at Ol Pejeta worked to figure out another solution. Experts from Dvůr Králové Zoo, IZW Berlin and Avantea Institute in Cremona, Italy, have been working for the past two years on a plan to save northern white rhinos from extinction even if Sudan were to die. They aim to use a southern white rhino surrogate to carry a northern white rhino embryo created through in vitro fertilization. Sperm from now-deceased northern white rhino males have been stored in Berlin, Germany, for this very purpose. Northern white rhino eggs from Najin and Fatu, who are 28 and 17 years old, will be harvested to be fertilized in the lab. “The fate of the northern white rhino subspecies depends on this operation going smoothly,” Ol Pejeta wrote. This novel strategy has never been tried before on rhinos, and the lengths to which people are going to save this subspecies is a heartening silver lining to the sad truth of plummeting rhino populations. 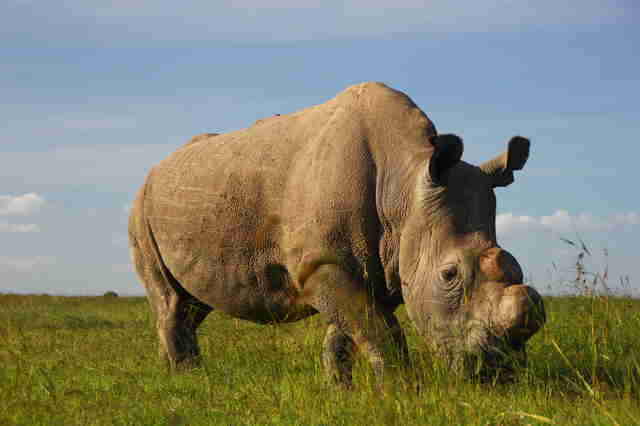 All rhinoceros subspecies are under threat because of demand for their horn on the black market; keratin from this source is so valuable because of the unfounded belief in Asia that it can cure all kinds of ailments, from hangovers to cancer (even though keratin is the same substance as your fingernails). Where millions of rhinos once roamed across Africa and Asia, it’s estimated only about 30,000 remain between all five species combined. Sudan's health took a turn earlier this year, when he got an age-related infection in his leg. He started showing positive responses to treatment, but soon he became unable to stand and he had to be put down. He will be terribly missed. To help support Ol Pejeta’s last attempt to save the northern white rhino, you can make a donation.